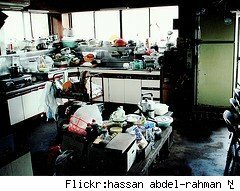 When I was raising my sister Ella, I desperately tried to reduce the level of clutter in our house. However, it seemed that as soon as I took one thing out the front door, she brought three things in the back. Finally, as every flat surface in the place got covered with junk, I had a serious talk with the kid. It turned out that she simply felt more comfortable in a house that was packed. Where I saw a room full of potential hazards and health-code violations, she saw a space that was full of protection, barriers against poverty, and security against the outside world. Ultimately, we reached a compromise: I let her load up shelves with tons of stuff, but the floor and tables had to remain free of mess. For the most part, she honored our deal. I've seen this same perspective in a lot of other places. Many people, particularly ones who have had some experience with privation, seem to view possessions as a hedge against poverty. The thinking seems to go something like this: "If I ever need money, I can sell this pile of junk and survive for a while longer. Besides, I can't be poor--look at all the stuff I own!" The simple truth, though, is that a pile of junk really isn't that valuable; further, if you factor in storage fees, junk collections tend to push us closer to, not further from, the poverty line. Another reason for keeping stuff around is the belief that it will come in handy at some point in a distant, mythical future. The reasoning here is that the item, whatever it is, has intrinsic value, and the replacement price is significant enough to offset the cost of keeping it around for years and years. At its most advanced level, this perspective leads to the retention of used aluminum foil, saved zip lock bags, and impressive twistie collections. Obviously, it's easy for this to get out of hand. In some cases, this perspective is absolutely true. For example, I probably should have kept my Christmas tree stand. I knew, for a fact, that I would be using it in December. Still, I let it go and had to replace it. On the bright side, the new one only cost me five dollars. On the other hand, I haven't missed my waffle iron, my stand mixer, or the downstairs futon. I gave my supply of plaster bandage to my sister, my tools to my friend Chris, and my backyard grill to the guy down the street. I also threw away most of my tupperware and cleared out all the birthday candles in my junk drawer. Oddly enough, I don't really miss any of this junk. If I need tools, I can rent them, and if I need tupperware, it's not all that expensive to buy. Maybe that's the key to getting rid of the "I might need it someday" items: if the replacement cost is small, then I have to ask if it's worth keeping the stuff around. If the replacement cost is high, I have to honestly weigh the chance that I'll ever use the tool again. In the case of the stand mixer, the answer was a definite "no." Sentimental items are the hardest to get rid of. For example, although I've lost hundreds of pairs of sunglasses and dozens of hats over the last thirty years, I somehow managed to hold on to a "oven grill repositioner" that I made when I was a cub scout. While I am still impressed by my ability to make four saw cuts into a flimsy paint stirrer, I also realized that it's relatively easy to reposition an oven grate using a hot mitt. Ultimately, I let the little wooden tool go. Looking through the tons of junk that I'd managed to save over the years, I came to a realization: deep down inside, I was preparing for the museum that will one day be erected in my honor. As ridiculous as this may sound, I could think of no other reason for the fact that I was holding on to numerous "certificates of participation" from various field days and camping trips, not to mention the birthday cards that I had received when I was a kid. I ultimately had to ask who cares about this junk? Older and wiser, I cleared out a lot of my childhood. I gave my graduation suit to Katrina relief, along with a few blankets that I picked up in Scotland and a lot of "sentimental" t-shirts. I also got rid of my baby blanket, which was made of non-flame retardant, easily-meltable fibers. Looking back at these reasons for keeping clutter, I can't really fault anyone for falling victim to them. After all, I, too, suffer from acute packratitis. However, realizing the reasons for my packrat tendencies has made it a lot easier to move beyond them!